Although many new restaurant owners want to do everything by themselves, it is not necessarily the best way to maximise the potential of your business. There is a great of business support available. Don’t forget that people love to help, so asking for advice does not need to be a sign of weakness, or that somehow your new venture is doomed to fail. 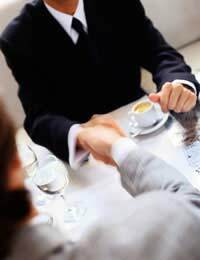 Think of it as flattery – when people ask your advice, you are probably flattered to have been asked and trusted, to why not make the most of it for the benefit of your new restaurant business? Attending trade shows and exhibitions are a great way to get restaurant advice as the companies that go usually want to speak to potential customers. Even if you do not plan to buy from them, in which case perhaps keep that under your hat, you can still get great free advice. There are a number of national and international trade shows that are connected to the hospitality industry. Some are more focused on hotels than restaurants, but you will usually find similar exhibitors at both. These are perfect for learning about the equipment side of the business as there is usually a number of catering equipment representatives – what cookers, extractor fans and fridges are the best, for example. They are also good for finding suppliers of particular products, such as tablewear, napkins and glasses. You will often find a number of food and wine suppliers too, not to mention innovative products such as new bar snacks. Many of the people that attend and exhibit at such events are highly experienced in the restaurant trade, so get chatting to people wherever possible – at stands, in the coffee queue and even in the hotel at breakfast. If you are planning to open your own restaurant, chances are you have gained some experience in the restaurant and hospitality industry. Unless you got sacked for gross misconduct, why not speak to your old boss or ex colleagues and chat about your plans. Talking to someone in the business helps to give you another perspective over and above your own or your families. You do not have to take all their advice, but it is good to have a sounding board in someone who has ‘been there and done that’. If you have a local Chamber of Commerce or Business Link, make an appointment with their advisor. Although they may not be full of helpful advice (although they can be!) they can at least point you in the direction of suitable trade organisations or business people in a similar position that you maybe able to chat to. You can also get great advice from local business people that have already succeeded in the restaurant trade. Some people may not want to spill all their secrets, of course, but others will be happy to talk shop over a glass of wine. Target restaurants that you think are doing good business and pop in for a drink; you may get chatting with the owner and learn some gems.